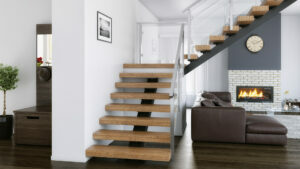 Modern Staircases & Railings / Floating Stairs / How Much Do Floating Stairs Cost? Mono Stringer Floating Stairs typically cost somewhere between $5,000 and $30,000. This range is so extreme because the factors surrounding floating stairs are highly customizable and there are many finish options. It is possible to find cheaper options, but those options are limited to a single standard use and are a riskier choice. Viewrail Floating Stairs, on the other hand, cost an average of $12,000 and give you a custom-designed, custom-engineered, and hand-crafted staircase that meets code and will last for years. Floating stairs are purchased in a similar way as a car. When buying a car, the price will depend on the make, model, year, mileage, and trim package. 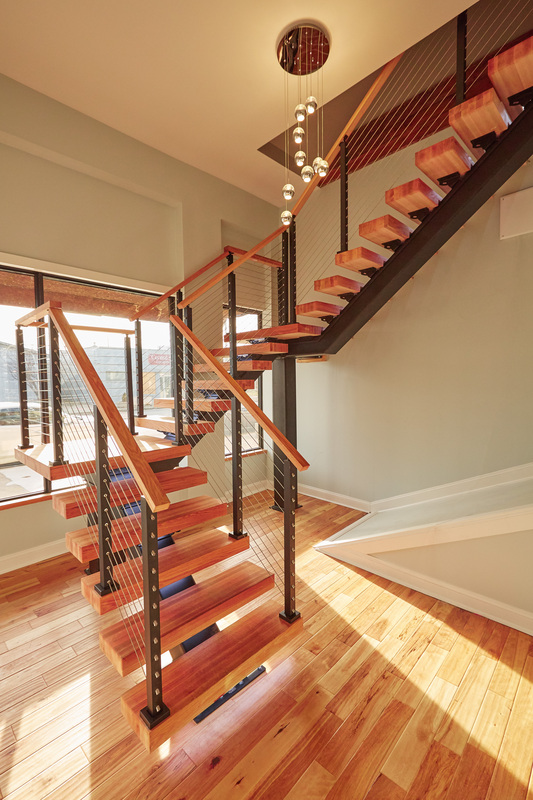 When buying floating stairs, you’ll look at other details: your project’s floor-to-floor height, the number of turns your staircase will take, the type of wood species and stain color for your treads, and what type of railing you want all will influence the pricing. A basic model of a floating stair may be relatively inexpensive, but as you add to the project it will add to the total project cost.The higher your floor-to-floor height, the more expensive your floating stair will be because you will need more materials to achieve a higher elevation. A straight run will cost less than a more complicated run for the same reason: more necessary materials. The wood species you choose to use for your treads will also cause the price to vary—some woods are less expensive than others because of availability. In order to keep costs down, you may choose a less expensive wood and stain it to look the way you want it to. If your railing system is made out of aluminum, the total cost for your project would be less than if you used stainless steel, but stainless steel provides extra strength for more robust applications. There are many factors to consider, which makes it hard to say exactly how much a floating stair should cost until you get an actual quote. If you’d like to see a ballpark price for your own floating stair, use the tool below. Just put in your floor-to-floor height and whether you’ll have railing on one side, both sides, or neither in order to get your estimated price range. Insert a floor height to begin. Since every one of our FLIGHT floating stairs are custom manufactured, we can accommodate virtually any level of customization. Whether your project requires a full 180 degree turn or just a single straight run, we’ll be able to make it happen. The tool below will give you ballpark pricing for a single mono stringer, treads, and railing (should you choose that option). If your run isn’t straight, simply fill out our FLIGHT design form and one of our floating stair specialists will contact you as soon as possible. If you’re ready to narrow down your options and get more specific pricing, fill out our design help form by clicking the button below, or give us a call at (574) 742-1030. You can expect a quick conversation discussing general information about your project and you will also receive a quote either during the call or soon thereafter.